Dorit Schwartz trained at the Northern School of Contemporary Dance where she gained a first class Honours Degree in Dance. 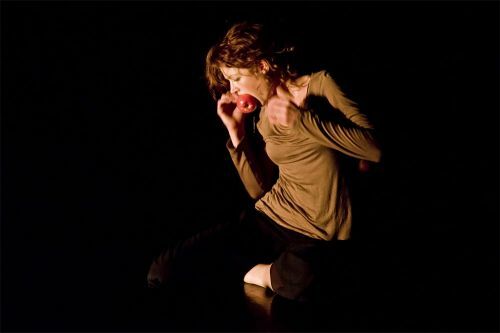 She received her post-graduate certificate in Choreography from Salzburg Experimental Academy of Dance.Dorit has been presenting work in the UK, Austria, Italy and Israel. She has also made work in collaboration with lighting designers, scenographers and directors. Dorit has shown work, amongst others, at The Place, the BAC and the Lillian Baylis Studio. The Apple Of My Eye is about human nature and the raw emotions that surface when relating to another. It shows how the boundaries between tenderness and aggression, between delicate and forceful easily fade. The performers deal with the power struggle with one another and the internal struggles of their own. Although the piece does not have a ‘direct’ storyline, the images, the energy and the emotions that surface can communicate with a diverse audience. The piece is very physical and intense, whether in tender and slow moments or in aggressive and explosive ones.